A vegan chili chock full of veggies, beans, sweet potato and tofu and seasoned with curry and garam masala might seem a little quirky or odd but it tastes fantastic. 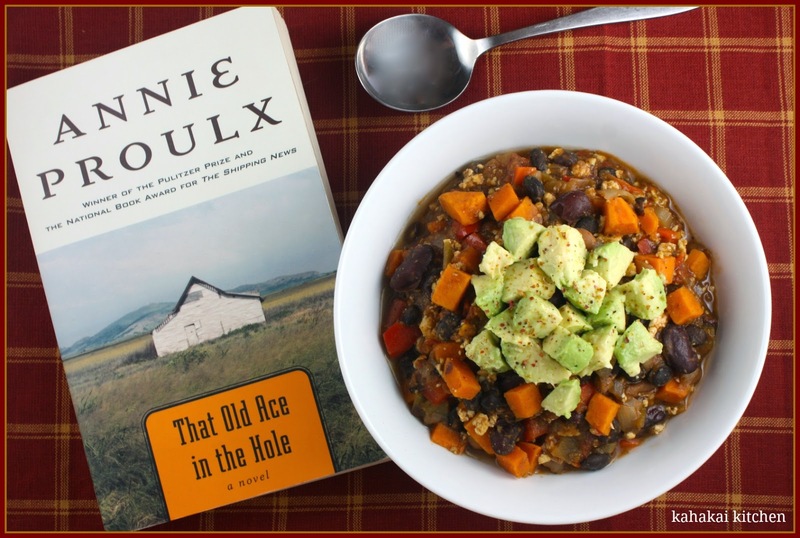 It also fits the mood of our October/November Cook the Books selection, That Old Ace in the Hole, a novel by Annie Proulx, hosted by Simona at briciole. Set in the Texas Panhandle, (the rectangular area in Texas that's bordered by New Mexico to the west and Oklahoma to the north and east and made up of the northernmost 26 counties in the state), the story centers around Bob Dollar, working undercover for Global Pork Rind, seeking property that can be developed into industrial hog farms. Bob winds up in the tiny, dusty town of Woolybucket where he meets the quirky people that make up the area and learns their stories while trying to buy up their land. I will confess that I had a bit of a struggle getting into this book and it sat for several weeks as I picked up my Book Tour review books and several books on my to-be-read stack, and virtually any other reading material rather than That Old Ace in Hole. 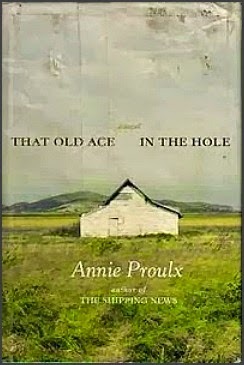 I had not read anything from Annie Proulx before--including her acclaimed The Shipping News (although I did see the movie and found it kind of dull--probably why I never picked up the book), and I just couldn't seem to drum up enthusiasm for Bob Dollar and the other characters. I hate not finishing a book though and so I finally picked it up and resolved to read at least 50 pages a night until I finished it. I am not exactly sure when or why it happened, but Proulx and Bob Dollar won me over somewhere in the middle of the book and instead of a chore to finish, it became a book I was eagerly reading. The author paints a vivid picture of the panhandles of Texas and Oklahoma, the people who live there, and their love of and pride in the land--despite all of the rough conditions. It's not an area I know much of anything about and she made it come to life. I grew attached to Bob Dollar and the interesting people he encounters and befriends and enjoyed the humor that Proulx infuses the novel with. I am glad Simona picked this book as it isn't something I would have picked up on my own, and I am glad I stuck with it. 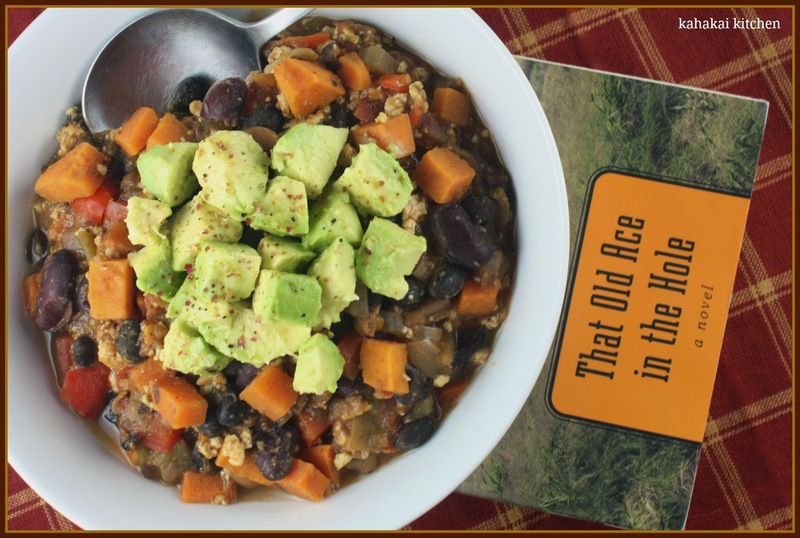 On first glimpse, That Old Ace in the Hole doesn't seem like a foodie novel, but there is a surprising amount of food mentions--both classic and quirky. I wanted to visit the Old Dog Cafe and try some of Cy Frease's cooking--loving his every-other Saturday trip into Austin to shop at Whole Foods because "Cowboys deserve to eat wholesome too." I took my inspiration for my dish from a couple of places--first, the curry and Indian spices that "crazy Dutchman" Habakuk van Melkebeek's cousin brought from Java for a rijstafel (a Dutch word that translates to "rice table"--an elaborate meal of many courses) that was served by angry cowboys. A few months after the dinner and its legendary spicy sambal, "tins of curry powder and jars of mango chutney appeared on the shelf behind the counter at Steddy's store and several ranch cooks made it their business to use both liberally, the beginnings of the famed Woolybucket curry chile, always served at the Barbwire festival, the recipe jealously guarded." I knew I had to make a curry chili and the addition of the sweet potatoes came about from the mention of a small bag of yams that pioneer Martin Merton Fronk took with him on his journey from Kansas to Woolybucket to find dry air and a doctor to cure his breathing issues. I happened to have a large sweet potato on hand and thought it would compliment the curry flavors well. Heat 1 1/2 tablespoons olive oil in a large heavy pot over medium heat. Add onions, carrot, celery, and red pepper and saute for 6-7 minutes until veggies are softened and onions translucent. Add garlic and spices and cook for anther minute or two. Add sweet potatoes, tomatoes, chilies, broth, and beans and bring to a boil. Reduce heat and simmer about 20-25 minutes, until veggies have softened. Meanwhile, heat remaining tablespoon of olive oil in a frying pan over medium heat. Take prepared crumbled tofu and add to pan. Stir-fry tofu crumbles about 6-7 minutes until slightly browned. Gently stir tofu into chili mixture and cook another 10 minutes to allow flavors to meld. Taste chili for seasoning, adding salt and black pepper, or more spice to taste. Serve warm garnished with avocado, and/or cilantro, mango chutney or yogurt. You can also serve with basmati rice if more starch is desired. 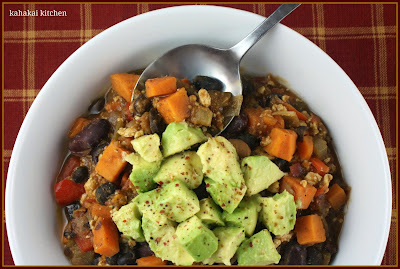 Notes/Results: I am sure nothing compares to the famed Woolybucket curry chile but this turned out to be a great bowl of not-so-traditional chili. It has a subtle heat and you get the curry flavor at the end. The sweet potatoes add a hearty touch and their sweetness is a nice contrast to the heat of the spices. The tofu, while not necessary, adds extra protein and gives it that ground meat texture (traditional-style Texas chile is usually without beans and just ground meat), especially when you freeze and defrost/drain it well, then press it before cooking. I was planning on topping my chile with mango chutney or serving it alongside but unfortunately my jar of chutney was a bit older than I thought and tucked away in the fridge, it had developed a layer of fuzzy mold (whoops!) and I was too lazy to go to the store. The avocado added a creamy texture and made a nice color contrast so it made a good replacement. You could also top with some cooling yogurt or sour cream and cilantro would be nice. Like all good chili, it tastes even better reheated the next day. A happy experiment, I would make it again. The deadline for publishing your post inspired by That Old Ace in the Hole is Tuesday, December 2nd. 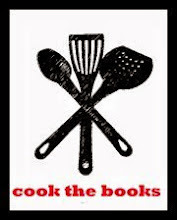 Simona will be rounding up the entries on the Cook the Books site soon after. If you missed this round, please join us for December/January when we will be reading Sustenance and Desire: A Food Lover's Anthology of Sensuality and Humor by Bascove, hosted by Rachel, The Crispy Cook. It's Thanksgiving weekend so the Souper Sundays kitchen is pretty quiet but the lovely Janet is here with a salad to share. 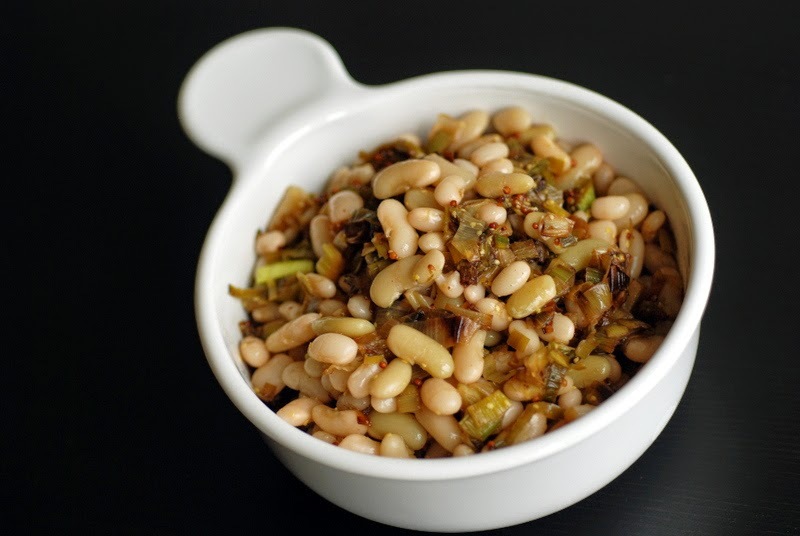 Janet of The Taste Space made this hearty and healthy Caramelized Leek and Flageolet Bean Salad. She says, "So, how are you faring with the first blast of winter? Turns out my furnace was not up to the increased stress and stopped working. Twice. For the past two nights, we have woken up to a fairly frigid home. At least we have warm blankets, so you don’t really notice until you escape for breakfast. ... I thought, perhaps my salad days were over, too. But this is a delightful salad warm or cold. A bunch of leeks are caramelized and added to creamy flageolet beans and coated in a simple lemon-mustard sauce." Thanks to Janet for joining me this week. If you have a soup, salad, or sandwich that you would like to share, just click on the Souper Sundays logo on the sidebar for all of the details. I've never thought to put curry IN chili, but that is genius. Just genius. I liked the image of curry powder and mango chutney in a rather unlikely place. I am glad that you made a curry inspired by the reading. And I am glad that the book sort of grew on you. Sometimes we fall for a book right away, sometimes we need a bit longer. It certainly got me curious to see this part of the country. Thank you so much for your contribution to this edition of Cook the Books. 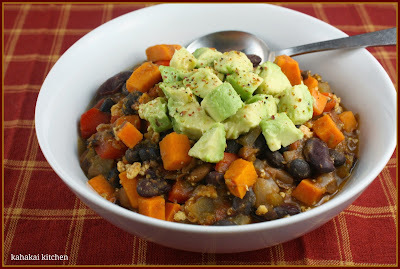 Wow...curry and mango chili...very creative and it sounds absolutely yummy Deb. G'day! 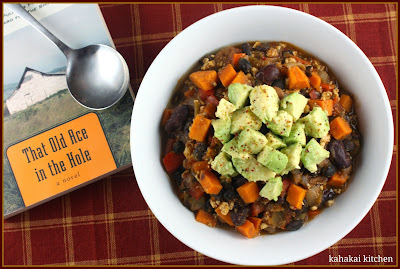 Looks delish and a chili I want to dig into right now! Congrats on also completing this month's Cook The Books Challenge too! That chili looks amazing!!! Glad the book picked up for you! I remember it picking up in the middle, too, but then I lost interest again!